This weekend will be the first time I will miss a holiday with the kids. I am going away with my mom and sister to celebrate my mom turning 60. In September I wrote about our journey to the world of toilet training. At the point of writing the post, we were about 6 days into it. Now we are at the 6 month mark - which is cause for celebration, or at least a reason to buy some new Spidey underwear! Ben is doing fabulous at home and at school with toilet training. He is proud of himself, we are proud of ourselves and we only see progress ahead. That's not to say there are setbacks, which are usually caused by us not being on a consistent schedule with Ben. In the last months, we introduced a Big Mack button to try to help Ben communicate his toileting needs to us. Before Ben sits on his potty, he pushes the button and the recording says, "I have to go to the bathroom." Ben's school has been extremely supportive with our efforts to train Ben. At Ben's IEP meeting, the school agreed to use the same button, wording and process each time he used the bathroom. It is working! On a few occasions at our house, Ben has crawled or led others to the door of the bathroom or pushed the button on his own to show his need to use the bathroom. At school, he consistently pushes the button without being prompted. Right now, Ben wears underwear with a pull-up over. He may have 1-2 accidents a week at school and a few at home so this helps make the messes more manageable. According to the behavior therapists we consult with, wearing the underwear is essential. The child needs to feel the results of an accident, which a pull-up alone prevents. Our reward system is two fold: Ben watches a favorite DVD while sitting on the potty, and I sing a simple song I made up a long time ago when Ben has positive results. Other developments I have noted is that Ben has woken up in the middle of the night, dry, but obviously annoyed. I have come to the conclusion, that he needs to use the bathroom. Not sure what it all means, but I am just taking note and seeing where it leads. This summer, I may try removing the pull-up when Ben is at camp. That is a big step. We'll have to see if I am ready. Ben, Logan and Sean made these bunnies last year at the YMCA. It was nice to pull them out with our Easter decorations - I'd forgotten all about them. Bunnies are made with stuffed athletic socks,and then decorated with ribbon, markers, pom-poms, googly eyes and stiff thread for the whiskers. 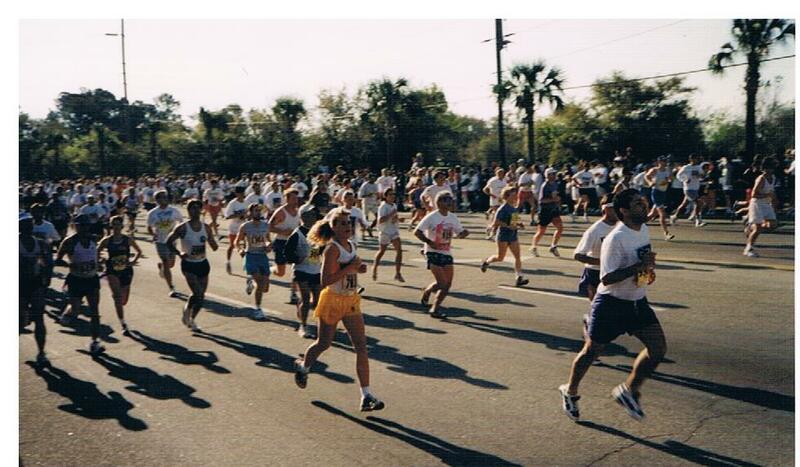 This weekend is the Cooper River Bridge Run in Charleston, SC. 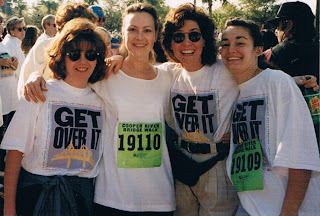 When I last did the race, I walked the 6.2 miles with a few friends. That was in 1995. 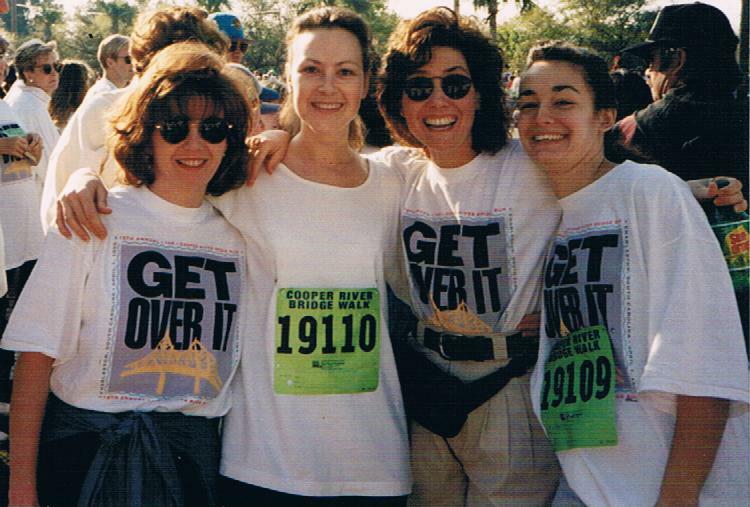 I have been trying to get back to this race for 15 years, but my job responsibilities interfered and then when I was not working anymore, I was pregnant, between pregnancies or just not physically able to do it. This year I made a promise to myself that I would do it. Over 38,000 people are participating, and I will be one of them. I am on the far right. About 9,000 people participated in 1995. I know my worth as a mother is closely tied to making lunch for school for my children. 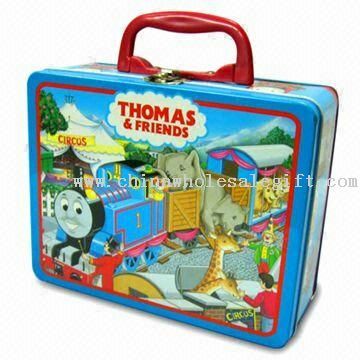 Ben is on a set schedule - Monday and Thursday he buys lunch in the cafeteria, all other days, he packs a lunch. We have a good system - Ben gets some variety, I get a break two days a week, but get my mothering needs met. My middle son, Logan, started full day school this year. At first he was adamant that he would not buy lunch - the whole process is intimidating and the food is a bit questionable. Since August, I have packed his lunch. And happy to do so. Two weeks ago, Logan came home and announced that he wanted to buy lunch. It was more fun and gave him more play time (still not sure what he meant by that - but in the mind of a four-year old, it made sense). So for the past two weeks, he's bought his lunch. I bit my tongue trying not to persuade him. In my head, I kept repeating that age old saying about, "If you love something, set it free. If it comes back to you, it is yours. If it doesn't, it never was." Finally yesterday, as I always do, I casually asked about lunch - well casually for me. Logan said it was fine, but he did not get dessert because he did not like the jello they had. Without getting too excited to hear that all was not well in the lunch-line, I asked if he wanted to bring his lunch tomorrow. Logan responded with, "I was thinking that too, Mom." Woohoo!!! I cheered quietly inside - He came back! He came back! I will lay off the cottage cheese for now, that was the last lunch I packed when he deserted me. Now I know why my Mom packed Suzy-Q's, Twinkies and Devil Dogs for my dessert for 13 years - who'd leave that? Ben and his friend have known each other for a few years through seeing each other at the park. This child always makes a point of asking about Ben when he's not around or saying hello when he is. I am always amazed to hear about parents, in the middle of caring for a child with medical or other special needs, who are able to pull together something so wonderful like an amusement park, a signing program or raise money to cure a disease. Rather than wallow in their own issues, they find ways to reach out to others and make a difference in not just their own child's life, but many others as well. They face the challenges of life head on - helping us all gain perspective on our lives and develop confidence in what we do. 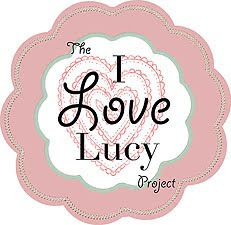 This is a lovely story about a family: I Love Lucy Project. Please check it out. This is also a link to a "sneak peak" from their book, "A Mother's Book of Secrets." The snowmen are made with cotton balls, yarn, googly eyes and foam noses. The background snow is paint and glitter. I took a big step today and purchased the domain for www.especiallyben.com. I was playing around with settings and such and saw that my own domain could be purchased if the name was not being used. I thought I would at least see if it was available...and then see if the price was within my non-existent blog budget. Alas, www.especiallyben.com was available and it was $10 for the year to purchase - definitely within my budget. So it became a done deal within minutes. Nothing should change - if you receive this by email, your subscription should be just fine. The old address will direct you to this new one. Perhaps my head will get bigger, you know, owning my own domain and all. I will try to keep it in perspective...tomorrow. 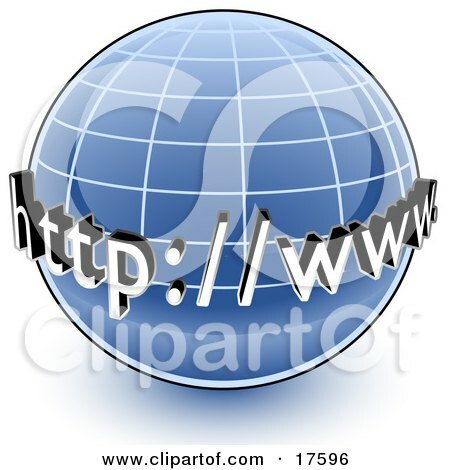 Today I will bask in the glory that I own a part (albeit a very small part) of the world wide web. Tomorrow, I will be annoyed that had I not used Google as a middle-man, I could have paid $7.49 directly to GoDaddy.com! Today - We are all Irish! This was sent to me by my stepfather. The words are beautiful, the meaning significant. This put me in a thoughtful place. and chasms are to be crossed. who is worth that name. you in times of sadness. of daily life at your side. and all who care for you. To see the version with amazing photos of Ireland - click here! and having visitors made Ben a little too excited to eat. You may recall that Ben had an accident a couple of months ago - he pulled a TV and table down on himself. Luckily, he was fine - cannot say the same for the TV though. Since then, we have made changes in the house and researched ideas on how to make areas safer for Ben. The sign works if we are in the room with Ben and able to say, "No touching!" He actually listens and moves away. I do not trust that it works if he is unsupervised. In other words, I do not think the sign keeps him honest, or safe for that matter. For now, if we cannot be in the room with him, then he is strapped into his chair. I am too nervous about him putting his hand on a hot stove top or pulling something down on himself. I wonder about his ability to understand danger and if he is capable of fear. Until we know more or come up with another idea, I see big red stop signs in our future. Grandma's birthday is coming up and Ben made a Caterpillar Birthday Card to send. An email just arrived informing us that Amazing Race is being rescheduled for the fall due to low registration. I was looking forward to it, but now I have more time to study my Charlotte trivia. I may also volunteer to help publicize this event because I do think it has the potential for being successful in terms of raising scholarship funds and awareness about the camp itself. For those of you who sent in donations, first of all - thank you so very much! Secondly, I have emailed the organization to see what to do about the donations I have received. Most likely, I will send the checks back to individual donors. Thank you all for your help with this and I will keep you updated about the new date. Will be back in full force next week - sick last week and then Uncle Brian (my brother) visited this week. Check this out in the meantime: Story about a Dad who creates an amusement park for kids with special needs. Not just an ordinary painted tree. First, tape is added for the branch effect. Second, paint over the tape and finally, pull the tape off. Pretty cool! Ben's summer camp, coordinated through the Therapeutic Recreation Division of the county park service is planning a fundraiser called Amazing Race, based on the reality TV show. Teams of two will compete on Saturday, March 20, for a trophy. Being a person who lives on the edge, I signed up right away. My teammate and I will solve challenging puzzles, find crazy hidden messages and possibly eat dead worms - I made that last part up (I hope). We do have to know our local history. Our starting time for the day of the event is based on our score on a trivia contest a few days before the race. On the day of the race, we have to walk and run to get to each location. No cars, bicycles, mopeds or public transportation allowed. No mention of brooms, though. Ben has attended this camp for the past three years on scholarship. It is a wonderful camp offering really cool weekly field trips to amusement parks, zoos, and Monkey Joe's. Each group goes swimming at a special zero entry pool once a week. My Gym and a local librarian visit the camp on a regular basis. The ratio is about 1 counselor per 2 children. This specific camp serves children and young adults with disabilities from age 3 through 21 years old. Because this is a site specifically for donations, be sure that you request that your donation go to TR Summer Camp Scholarship Fund. "My Three Sweet Flower Girls"
Check out other Special Exposure Wednesday Photos. In my effort to turn 40 this year as a healthy, less stressed and fit woman, wife and mom, I challenged myself to run a race a month this year. I was inspired by another mom blogger who wrote about skipping her own doctor's appointments, gaining weight, eating poorly and then finally realizing that putting her own health in jeopardy was dangerous business for her entire family. I hope to spread this inspiration to other parents who may need to challenge themselves to take better care of their health. This can translate to mean more time with friends, reading a favorite book at the coffee shop alone, taking hikes or enrolling in a cooking class. The challenge for parents is to put themselves before their families once in awhile to enjoy something without feeling guilty, anxious or regretful. I finished my second race, a 5K at UNC Charlotte. It was a tough one because of the hills. I expected them, but had not trained well for them. My trainer friend says she will introduce me to hill repeats. I technically came in 5th in my age and gender class - there were not many women in my age range running. More impressive than that (yes, I am tooting my own horn), I came in 31st in all females, out of 370 participants. And most runners were college age students. My next race is at the end of March in Charleston, SC. 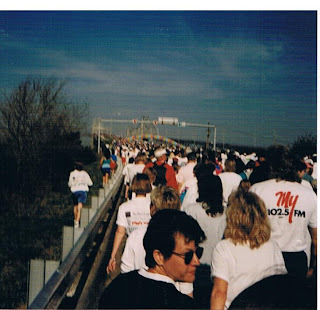 The run is 6.2 miles, with three of it going over a bridge. The hill is steep and long. I have my work cut out for me. And more important than the run is that I am going there without husband and kids - this is a girls only weekend - a reward for sticking to my healthy lifestyle and losing a few pounds and inches. As I write this, I am eating M&Ms - so if anyone has delusions about an exemplary lifestyle, you may give them up. Since Ben was born, I have taken advantage of the photo studios with the low price package specials. They usually include a 10"x13" enlargement. Not knowing what to do with such a large photo, I decided to laminate them to be used as placemats. The kids love to use these placemats because it is fun for them to see themselves as babies. It is a great way to keep the photos preserved. We also play the game, Whose that baby? The Halloween photo is the most confusing because they are all wearing the same pumpkin outfit. The lamination was done at Office Max, costs no more than $3. Use their largest size, do not cut it down. Be sure to put the child's name, age and year the photo was taken on the back in permanent marker before lamination. An 8"x10" photo may be used also - in fact the second placemat has the smaller photo. When the kids get older, I will allow them to use wipe-off markers to "decorate" the photos adding mustaches, spiky hair and other things to each other's photos.